This cake came out of the oven and I immediately thought to myself, "this cake is so unattractive, no one is going to want to eat it." It was as if the cake could read my mind, and at that point gave up entirely. Over the next ten minutes it exhaled, deflating into what I can only describe as a compact, sway-backed, brick of chocolate-fudge. Or what I'll forever think of as chocolate ugly cake. I set it aside, went out for the night, came back the next morning, and cut off a thin slice. The cake, while still hard on the eyes, was perfect in so many other ways I can't not share it with you - deep chocolate flavor, barely set center, indiscernible crumb, with a thin brown sugar crust. 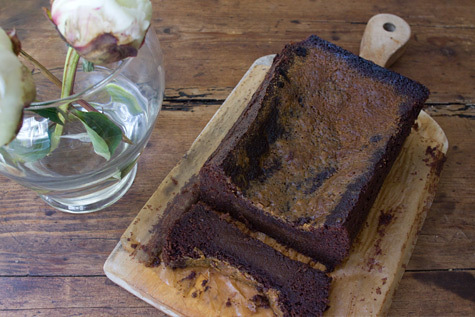 The cake was inspired by a recipe in Nigella Lawson's How to be a Domestic Goddess, her Dense Chocolate Loaf Cake. 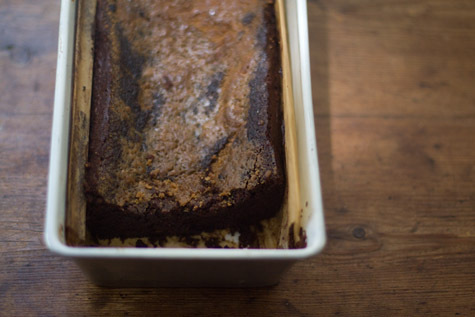 As many of you who have been readers for a while know, I love a loaf cake, and she describes her chocolate version as "the plainest of plain loaf cakes." She goes on to celebrate the fact that its "dark intensity isn't toyed with, nor upstaged by any culinary elaboration." I tried to keep the spirit of her cake in mind, while making a few tweaks to make it my own. I think I may have crossed into the land of culinary elaborations, and for that I apologize, but whatever happened it was well worth it. Here's what I did...I used dark Muscovado sugar instead of white sugar. I'd argue, this was the most significant change I made. I also zested the pan with fresh lemon rind before filling with batter. Spelt flour in place of all-purpose. And a generous sprinkling of Muscovado sprinkled across the top was finished under the broiler. I was regretting this as I was doing it, it was only adding to the cake's aesthetic issues, but I loved every bite that had a bit of Muscovado crust. Here's the thing. You MUST let this cake age overnight. It makes all the difference in the world. If you brave the ugly cake, let me know if you like it as much as I did. If you are having a hard time tracking down Muscovado sugar, dark brown sugar is a reasonable substitute. Preheat oven to 375F / 190C with a rack in the center. Butter a 9x5-inch (23 x 13-cm) loaf pan and line with parchment paper. You have to line the pan if you ever want to get this cake out of it. Sprinkle with the lemon zest and set aside. Combine the flour baking soda, and salt in a medium bowl. Set aside. Place the loaf pan on a rack, let cool completely, and enjoy the next day. Makes 8 - 10 slices.